Printable chore charts to help you enlist the efforts of your kids in tackling the never-ending jobs around the house. With our chore lists, your kids will know what's expected of them, which will help the whole family stay organized. Use our suggested chores for your kids or customize with your own chore lists. 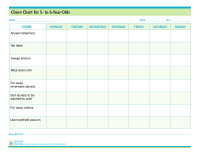 Help your 5-6 year olds stay organized with this weekly chore chart. This is an editable pdf which means you can customize it with your own chore list.